Until Outlook 2013, unless you were using Outlook as a client for a Microsoft Exchange server, you couldn’t send an email from a non-Outlook email account. 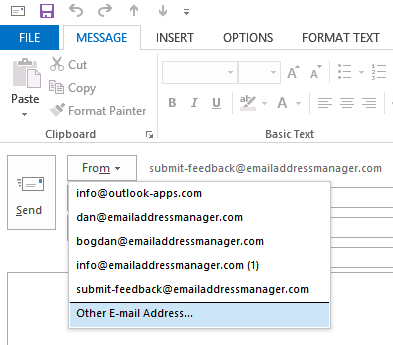 If Outlook was connected to Exchange, you could use the “Send on Behalf of” feature that allows you to put a different email address in the email “From:” field. Microsoft changed it with Outlook 2013. As a final comment, don’t think about using the “Send from other email address” feature as a tool to send spam! Obviously, you shouldn’t think to send spam emails anyway, but this Outlook 2013 feature actually uses the SMTP email server of your Outlook account, meaning that – if your email is marked as spam – it can be tracked back to your actual email account / SMTP server. Well, that doesn’t work with an outlook.com account: outlook 2013 offers to use another email as shown here but ends up using the default email chosen in outlook.com! Only changing this default email allows me to send from another address. I tried everything: any idea? Yes, it’s defined as an ActiveSync account. If I define my outlook.com account as a POP3 account, am I going to lose the synchronization of my data (email/address and calendar) between Outlook 2013 and outlook.com? Any way around that problem? I tried to have both ActiveSync and POP3 for the same Outlook.com account: it worked and everythign was in sync, except that, even when using the POP3 account, I was not able to send from a different email. (I had disconnected that POP3 account from the “receive all” command, to avoid duplicates email). The plan was to use the POP3 account only to send emails and nothing else! Not the workaround I was hoping for.. 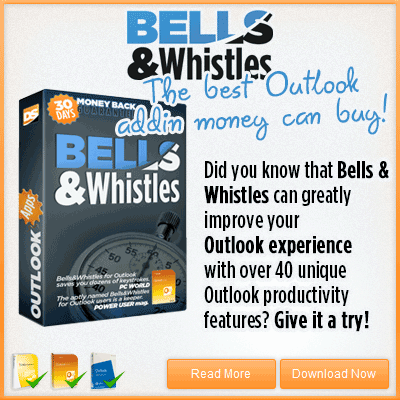 I have just tested with Outlook 2013 and a POP3 Outlook.com email account. 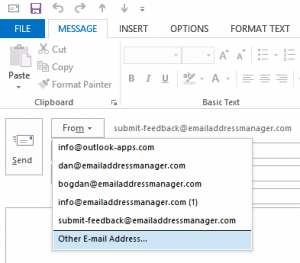 It is working fine for me, meaning that I can set and send from any other email address and Outlook does not replace it with the Outlook.com account. However, I think the key is NOT to have your Outlook.com account as the default Outlook account to send emails. If you have any other email account in Outlook, set it as the default one, then try again. 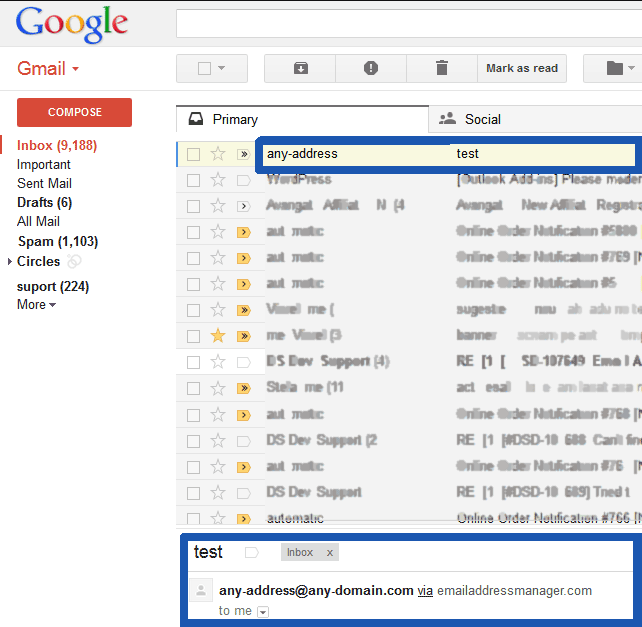 Or just create a bogus account at Gmail (or whatever), add it to Outlook, make it default and try again. I am trying to understand where our settings are different, because I am not getting the same outcome. I have set up the same outlook.com account in office 2013 as an ActiveSync account as well as a POP3 account. When I use the POP3 account to send an email with a different address, it’s still picking up whatever account is the default account in outlook.com. What I was thinking about is to create another outlook.com account with POP3, only dedicated to send email; it doesn’t matter which email it is since I can use anything I like. In that case my problem is that the “sent” folder is not being synced with everything else in Office. I must say that I like Outlook.com more than office365 that I used before but it still needs some polishing, and I am not even mentioning the smart phone app which has many deficiencies of its own! I think the issue is related to the fact that outlook.com accounts require an authenticated SSL / TLS SMTP connection to the mail server. 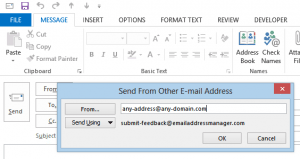 If an authenticated connection is required, then Outlook is not able to set other email address for the From field (because it can’t be authenticated). At least according to my tests… So can you try setting up an email account that doesn’t require an SSL / TLS SMTP connection? Also, assuming that I can send from another email, is there a way to set up a rule where all my sent email would automatically be copied into my main “sent” folder in my outlook.com account? I tried to create such a rule but it didn’t work. Same setup/problem here. As a less than ideal workaround, I am able to send from “another” email address when using the web interface on Outlook.com. But you’re right, it’s a no go from that same account when using Outlook 2013. This is the worst feature ever. Why would they ever do that? We just migrated from Lotus Notes and I can tell you Lotus Notes/Domino would never allow such b.s. You send mail from your address, if you try to send it from another address then your message should be blocked as spam. Besides a simple message header scan will reveal the real sender address anyway…All this does is put email admins in a precarious situation. In this age of identity theft, why would Microsoft think this is a good idea? I disagree with JoeNormal. It is a bad idea in a locked down corporate world. But what’s the difference between a private email sent from an Outlook client over a corporate network and an email sent from, say, a Yahoo! account over the corporate network? In practice little. Anyway, if your Exchange server is anything like ours, it will prevent an email from an unrecognized domain being sent even if these steps are followed. However that sending this way is not enabled/disabled through a group policy is shoddy. It’s also not the only way to accomplish this feat. 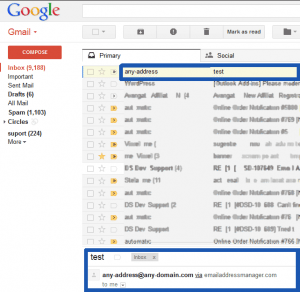 It’s always been possible to add an additional POP3 account which uses a different address and send the email through your favorite email server. The problem is it sends these mails from Office 365 account Outbox. I suppose due to it being default send account. 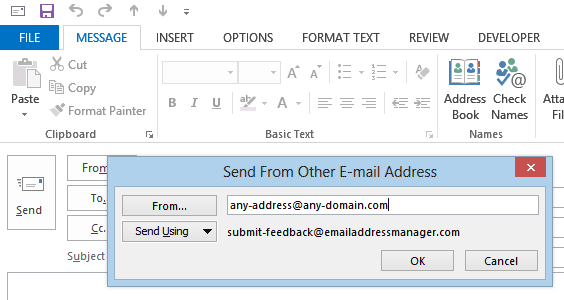 But in that case kindly help me understand what is the purpose of selecting “from:” field in the template when outlook is clearly ignoring which account i want to send these email from?